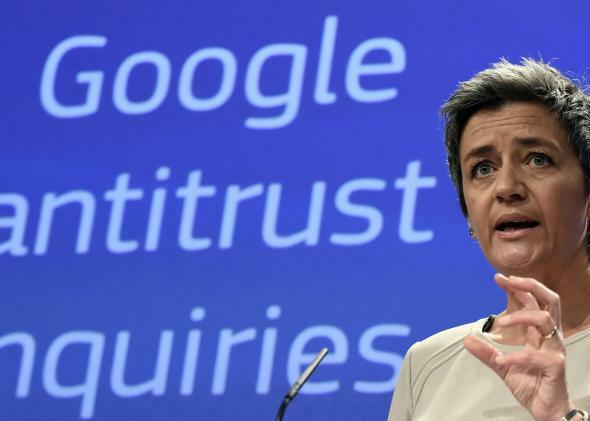 European Union brings antitrust charges against Google and starts investigation. EU competition commissioner Margrethe Vestager on Wednesday. The European Parliament has been vocally pushing for an investigation into Google’s alleged anticompetitive strategies since November. And on Wednesday, Margrethe Vestager, the European Union competition commissioner, announced in Brussels that such an inquiry is moving forward and that Google is being formally accused (through what’s called a “statement of objections”) of abusing its power in its ubiquitous services like Internet search and Android. The charges are centered mainly on digital shopping for now, but they could evolve to include other types of Web services as the investigation progresses. As the Wall Street Journal and the New York Times report, the concern is that because of its control over information services like search, Google is able to subtly but forcefully direct users to its own offerings ahead of others, even when the competitors provide better-quality services that users end up choosing more often. Multiple sites, including Yelp, have complained about this. “I’m concerned that Google has artificially boosted its presence in the comparison shopping market with the result that consumers do not see what’s relevant for them,” Vestager said. The investigation could lead to fines or other legal action against Google. But the company has been able to dodge similar consequences before. The Federal Trade Commission conducted an antitrust investigation of Google that concluded in 2013 without any legal ramifications. In March the Wall Street Journal published an internal FTC report, which supported the idea that Google was in violation and needed to be penalized. As Ars Technica points out, Vestager’s goal seems to be setting an example of legality, not interfering in commerce. She said, “We’re not here to create a market, to pick winners, we’re here to enforce EU competition law.” The results of this probe could shape the standards other Internet companies are held to in the future.